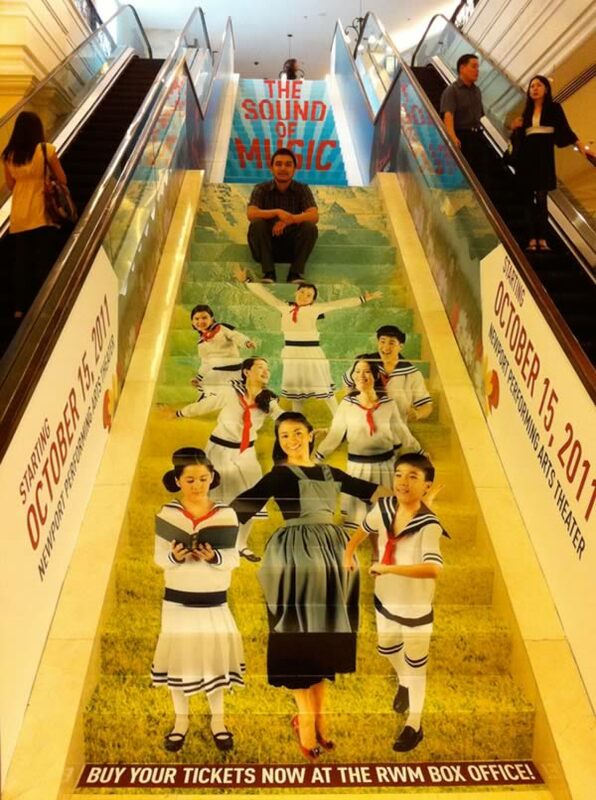 Resorts World Manila wanted to take a different approach in advertising the musical The Sound of Music and used a mall staircase to provide a visual for people going up the escalators. 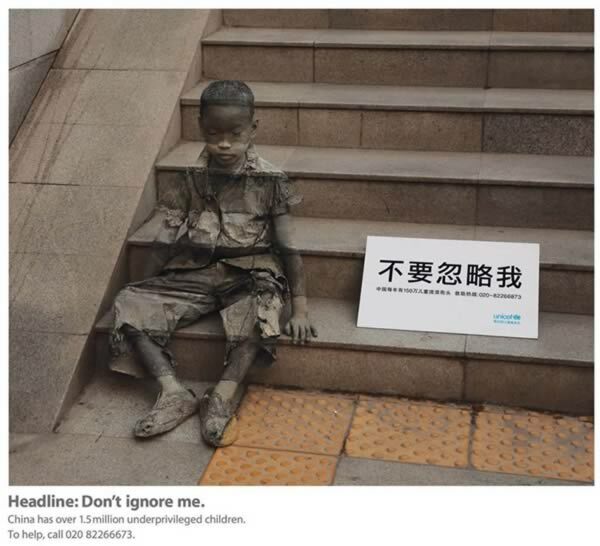 In 2008, the advertising firm of Ogilvy and Mather was commissioned to design an ad campaign for the Shanghai branch of UNICEF. The ad was aimed at drawing attention to the over 1.5 million children who continue to live in extreme poverty in China in spite of 30 years of continuous economic growth. Here is one of the images they produced. This terrifying National Geographic advertisment of a 3D crocodile is proving too realistic for comfort. 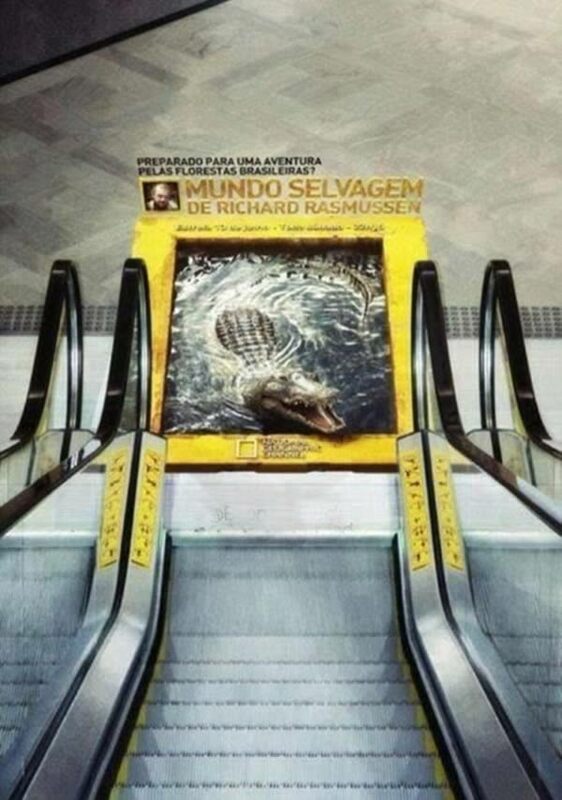 The optical illusion – which looks as though the sharp-toothed beast is ready to launch itself out of the water – has been scaring commuters traveling down an escalator in Brazil. It's part of a campaign for "Mundo Salvagem de Richard Rasmussen" which translates as: "Ready for an adventure through the Brazilian forests? Wild world with Richard Rasmussen." Check out this ad which aims to encourage consumers to reduce use of plastic bags and switch to reusable bags instead. For me, this realistic shark encourages me to take the stairs, just like the crocodile one. In 2012, Turkish Airlines was named the "Best Airline in Europe" for the second consecutive year. 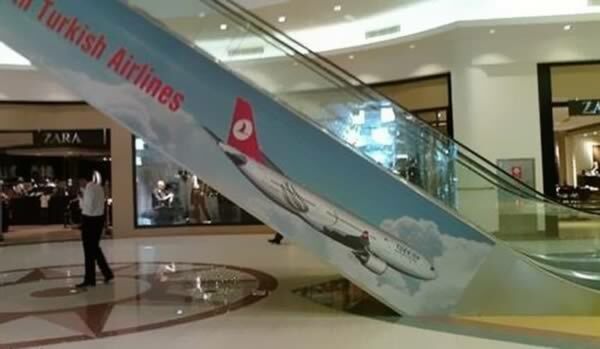 Unfortunately, the folks in charge of placing their advertisements aren't the same ones running the airline. Ikea's storage products are about innovative ways to save space. To highlight that notion, the store's main staircase was presented as a chest of drawers, with everything inside neatly organized. 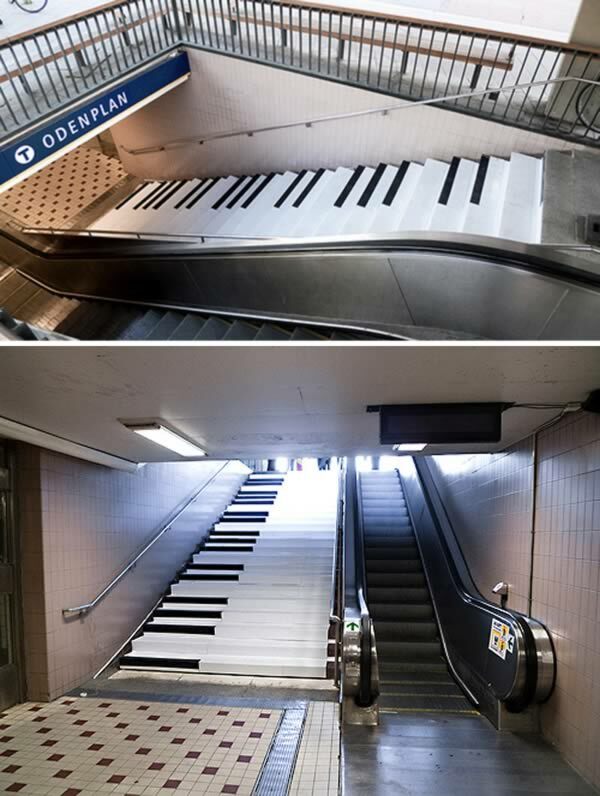 To encourage people to take the stairs instead of the escalator, the stairs at the Odenplan subway station in Stockholm were turned into piano keys. Not surprisingly, after the piano stairs were installed, 66% more people than usual chose the stairs over the escalator. 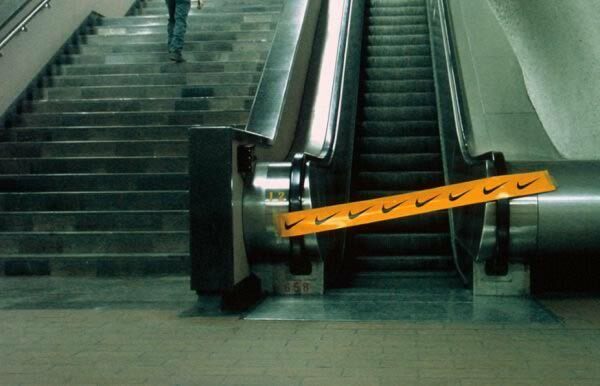 I'm all about being healthy, but if I crossed something like this guerrilla marketing campaign from Nike on an escalator in Mexico after a long day of wearing heels, I would be totally pissed at the brand. 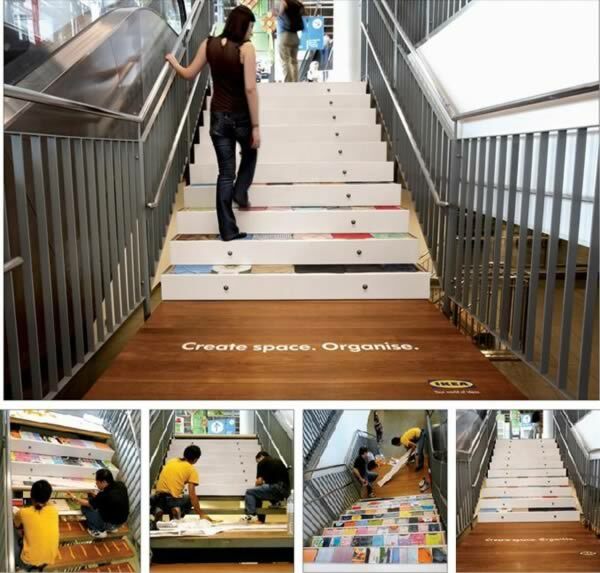 UpStares Media of Livingston, N.J., has taken advantage of the many escalators and stairs in the Northeastern U.S by specializing in staircase advertising since 2004. Its patented adStep product utilizes the riser above each step in a staircase. When viewed from a distance, the strips combine to form a complete picture, often in the form of a visual pun. 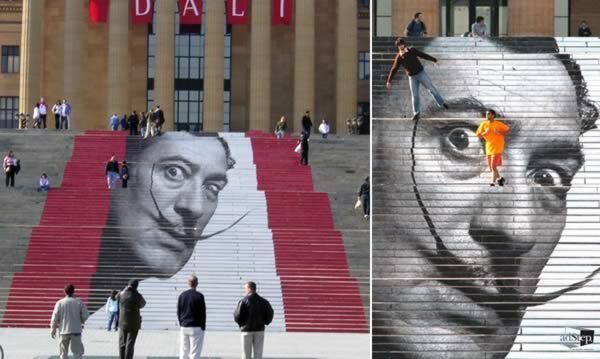 Take a look at what they did for Dali exhibit at the Philadelphia Museum of Art. Durex really made their point with this extra-long escalator ad.